Australian Dollar is under some selling pressure today, as Asian stocks weaken broadly. Canadian Dollar follows as the second weakest as oil price is starting to lose momentum. On the other hand, Yen and Dollar are trading as the strongest ones so far, with prospects of more upside for the day. Sterling slightly softer after UK Prime Minister Theresa May’s uninspiring statement on Brexit overnight. The Pound will now look into job data while Euro will look at ZEW economic sentiment. Hong Kong HSI is down -1.14%. Japan 10 year JGB yield is down -0.0031 at 0.002, still positive. One development to note is the loss of upside momentum in WTI crude oil. 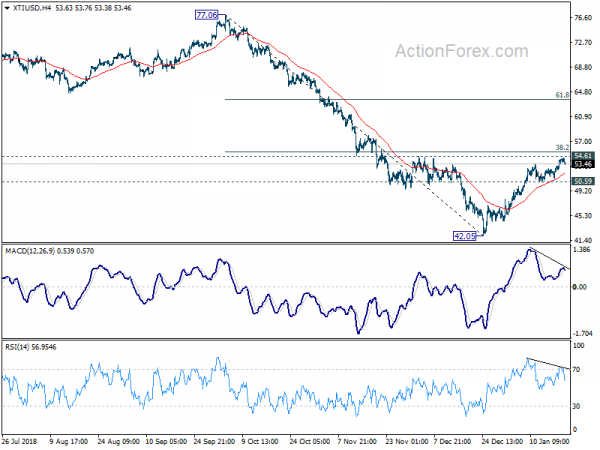 Bearish divergence condition is seen in 4 hour MACD and RSI. WTI is also close to an important resistance at 54.61 and 38.2% retracement of 77.06 to 42.05 at 55.42. First line of defense is at 4 hour 55 EMA (now at 52.01). Sustained break should confirm reversal and send WTI through 50.59 support. USD/CAD’s rebound from 1.3180 should accelerate should the fall in oil extends.